The Ribble Child and Shower Commode will appeal to children who do not require high levels of postural support, fashioned with exuberant colours to brighten it up. The removable padded seat allows this chair to be used as a toilet, over a toilet, or even in the shower. The comfortability factor is undoubted, with padded upholstery, height adjustable footrests, and swing away armrests, so you can adjust it to your specification. 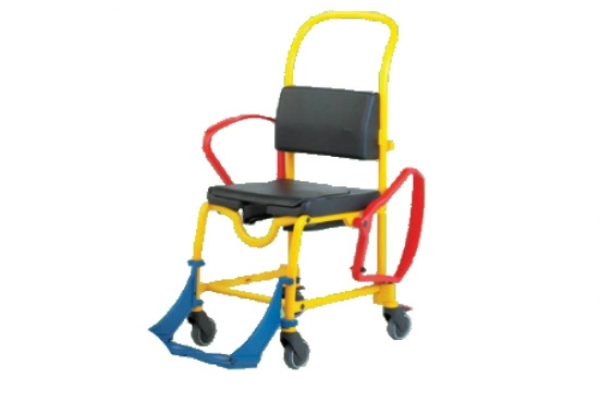 The frame is highly durable, and features 4 castors for good manoeuvrability, the rear two fitted with brakes. Back wheels braked and swivelled for easy directional control and transfer.